The recent reduction in the feed in tariff means that returns are less generous but we urge customers to look beyond the headlines that are dominating the news currently as Solar PV still represents a great investment. Glow Green Ltd has calculated that Solar PV can still generate an annual return of almost 10% – and it’s tax-free, linked to inflation and guaranteed for 25 years. Where else could you find an investment that pays such a healthy, predictable rate of return – and pays off your original capital outlay in less than ten years? 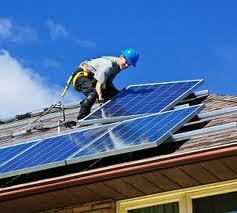 SO HOW DOES SOLAR PV WORK? Usually comprising a roof mounted system (but not exclusively), Solar PV is one great method of generating electricity for the home. Using light from the sun an inverter converts electricity from direct to alternating current. The end result is effectively electricity ‘on tap’ which can be used to power regular household appliances. But that’s not all, any surplus can be pumped into the national grid from where you can receive a payment through the Government’s Feed-In Tariff for the power you supply. The main stipulation to benefit for the tariff is that panels are approved by the Micro generation Certification Scheme (MCS) and that an accredited MCS Installer carries out the installation. Solar PV needs just sunlight to function, not the sun’s heat. Dull weather will still result in your PV system producing electricity. Maximum efficiency is gained from an installation which faces south, but system can still work when facing easterly or westerly. Positioning of panels is important for the process to work efficiently. The principles are simple; panels are placed in a position (normally a roof) that ensures maximum exposure to solar radiation. Shade will hamper efficiency, so consideration should be made for trees or buildings in the area which may block sunlight to the PV panels. You can sell electricity back to the main electricity grid. Any surplus of electricity can be pumped into the national grid from where you can receive a payment through the Government’s Feed-In-Tariff (FIT) for the power you supply when you’ve produced more electricity than you can use. With the right system in place this can lead to a good return on your investment. You’ll be happy to know that our team is MCS accredited; this means we can install a Solar PV system for you that’ll meet the requirements of the Feed-In Tariff. Your Solar PV will be linked to the national grid earning you (a reduced rate of) 21p/kWh for solar PV installations of less than 4kW. Your PV meter will show you what’s been generated in total and how much has been exported to the grid. The balance will be your own usage. For homes unconnected to the national grid solar can still be installed and you will still earn something for the electricity generated, although the extra from the export tariff will not apply. The Feed-In Tariff is set to run for 25 years from the date your PV system is registered. Please note that Glow Green Ltd does not currently offer installation of solar photovoltaic panels.